Fort William Solicitors, MacPhee and Partners, have raised £1,300.00 for Glasgow Children’s Hospital on behalf of Kinlochleven woman, Kat MacLean. Kat has been fundraising for the hospital to mark her 10-year anniversary of being in remission following a battle with leukaemia. Kat stresses that she wouldn’t be where she is today if it wasn’t for the wonderful doctors and nurses at the hospital and she has been arranging various fundraising events locally recently. After seeing Kat raise such a fantastic amount for the hospital, MacPhee and Partners decided to help her raise even more for the cause. The Solicitors gathered a team of 12 employees to take part in this year’s Colour Me Rad fun run on May 13th at Glasgow Green. 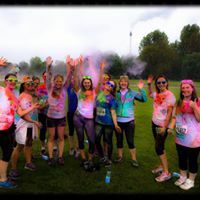 The 5K run fires off in a blaze of colour bombs, colour cannons, colour mortars and multi-toned courses. The group were hoping to raise £250.00 but below their target out of the water raising an incredible £1,300.00.